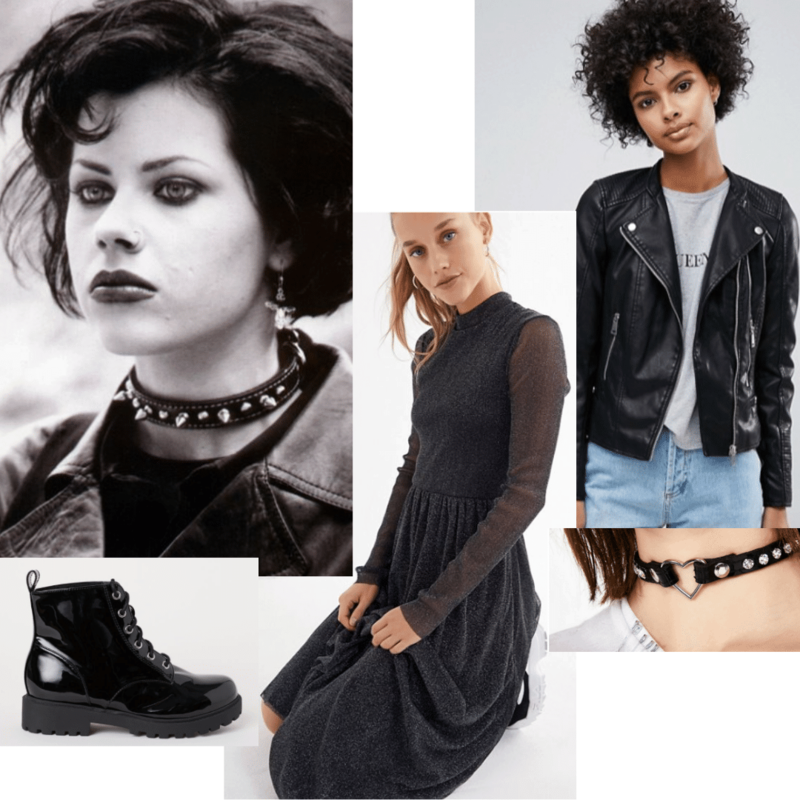 The second (literal) witch in our Bad Girl Inspiration series is Nancy, from the cult classic ’90s film, The Craft. In the film, a young witch, Sarah, starts attending a Catholic school, where she befriends and becomes enemies with a trio of teenage of girls who are obsessed with becoming witches themselves. Nancy is the head of the trio, being the most determined to hone the knowledge and power that witchcraft can give her. Right from the moment Nancy is introduced, there is certainly something sinister about her, and as the story progresses, Nancy becomes a manipulative witch who will do anything to be the most powerful out of her friends, even if that means murder. Nancy’s style is the perfect combination of 90’s school girl and grunge rock star. In fact, most of her looks throughout the film capture the true sense of the 90’s grunge scene that was so popular at the time. From her all black looks to her studded chokers, spiky hair, and oversized jackets, Nancy is certainly a ’90s style icon. This brings us to the fashion. Below are three looks that are inspired by Nancy’s killer grunge style. Each of these looks will certainly make you feel witchy, and as if you were the star of a rock music video. Though she has a tough exterior befitting the head bad witch of the group, Nancy is also a tragic figure. She is referred to as “trailer trash” and lives with her mother’s abusive boyfriend. When Nancy comes into her powers, her first order of business is to destroy her mother’s boyfriend and create a better life for herself and her mother. When Nancy gets her wish of becoming wealthy, she wears one of her darkest, yet chicest, outfits in the film. The look, seen above, is a two-piece black and grey top and pant set, with a mesh under shirt to make the look even more witchy. To get this bewitching look for yourself, a mesh top with structured trousers is a perfect choice. A few little accessories, like pointed boots and cross earrings, bring this look up to the next level. Nancy and her friends might go to a school that requires a uniform, but that doesn’t stop them from adding little witchy touches to their outfits to stand out from the crowd. Above, Nancy rocks cross earrings and badass boots with her school basics. When channeling the school uniform look, start with basic staples like a plain white button-up and a mini skirt. With this type of look any white top should do — knot yours at the bottom for a Nancy vibe. A short black skirt or plaid skirt will add a grungy feel to the look, and don’t forget to throw on some lace-up combat boots and a few cross accessories to complete the ensemble. Nancy’s most iconic look in the film, seen above, is when she goes full-on bad witch at the climax of the story. She pulls off an edgy, all black ensemble to achieve the ultimate grunge teenage witch aesthetic. This is a look that could work for any occasion, especially during the month of October. For this look, find a simple black dress with a flowy silhouette and pair it with a leather biker jacket. Accessories are also key when it comes to this look, especially the choker. The choker is an iconic 90’s grunge trend, and is certainly a must-have when copying Nancy’s wardrobe. What do you think of Nancy’s bad girl style? With this guide to three of Nancy’s witch inspired looks, you should now be inspired to go out and cast spells yourself, all while looking fashionable. Tell us what you think in the comments below!